Although it has operated under various guises (Goldfish and Bistro Allure) in its decades of operation, the Pullman Hotel’s signature restaurant has always been a hotbed of activity. From the notorious days of the Fitzgerald Inquiry to now, the space has enjoyed a storied history – and more than its fare share of excitement. 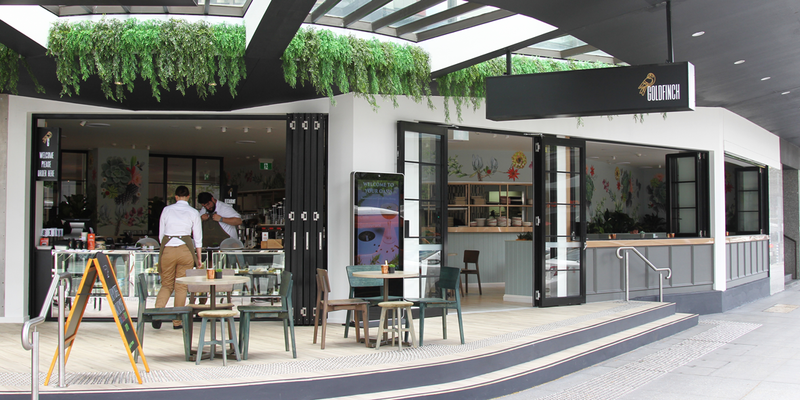 Seeking to bring the restaurant in line with Brisbane’s contemporary scene, the Pullman Hotel team has transformed the ground-floor tenancy into a multi-faceted airy oasis, with a stunning Hamptons-inspired fit-out that pays homage to the past while celebrating the future’s potential. Brisbane City’s drinking and dining scene is rapidly evolving, and the Pullman Hotel King George Square is looking to grow with it. Just over two years from the opening of rooftop bar Sixteen Antlers, the hotel (one of the first international hotels to be built in the city) is following up with a substantial overhaul of its ground-floor restaurant. Known to many as the former home of Goldfish, general manager Michael Daviss and the hotel team has sought to revitalise the space, making it a stand-alone venue that draws upon the hotel’s curious history as a celebrity hangout while simultaneously imbuing it with worldly inspirations and details to match The City’s changing landscape. Gone is Goldfish – long live Goldfinch. In order to bring the venue back to life and make it inviting, the Pullman Hotel team committed to a light-filled aesthetic that highlighted the tenancy’s winning elements. 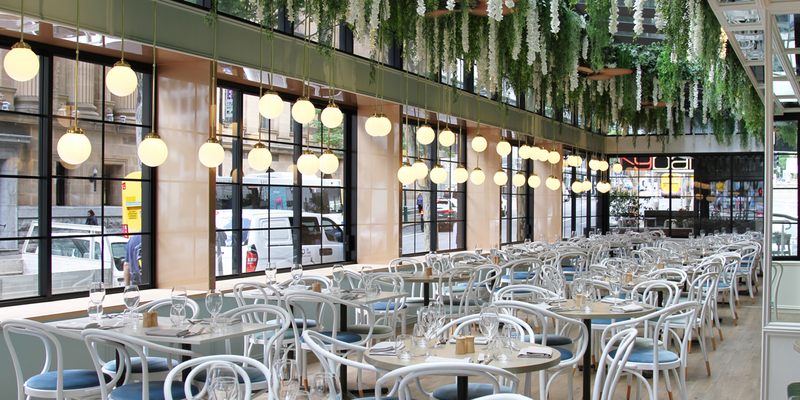 Goldfinch is separated into two parts – a street-front cafe and a sizeable dining room. Goldfinch’s dining room interior evokes a Hamptons-style aesthetic, with crisp white furnishings offset by pops of plush golds and blues, as well as greenery draping from the ceiling. As the name suggests, there’s a distinct aviary theme at play, with huge bi-fold windows opening up to Ann Street and a skylight above. The cafe boasts a sizeable coffee bar and order window facing King George Square, with accompanying booth seating situated under floral wallpaper. Both parts combine to act as a sanctuary from the inner-city bustle, with small touches such as the venue’s minimalist logo acting as nods to the past. Goldfinch’s biggest appeal is its substantial flexibility. Out front, the cafe specialises in barista-poured Elixir Coffee, grab-and-go morsels and an a la carte all-day brunch menu. Time-poor commuters and those moving at a leisurely pace can enjoy the likes of protein balls, acai bowls, granola, eggs benedict, smoked salmon and smashed avocado on gourmet bread from Gold Coast outfit Brasserie Bread. Over in the large dining room, service starts with breakfast for hotel guests, before moving on to a sumptuous lunch and dinner service that suits high-powered business lunches and slow-paced meals with friends. 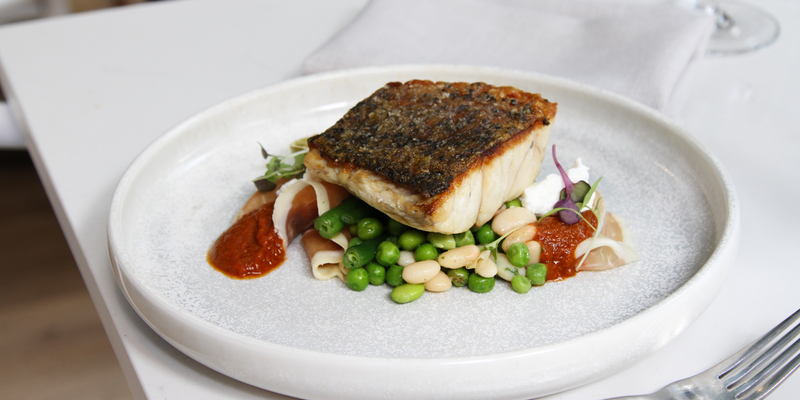 Overseen by head chef Gary Howieson and food and beverage director Ahmad Ghaddar, Goldfinch’s menu comes alive with Mediterranean inspirations, executed with locally sourced produce and boldly rustic flavours. While Gary isn’t looking to reinvent the wheel, his knack for doing more with less (sometimes only four to five ingredients per dish) results in some striking plated fare. Showstoppers include Fremantle long-leg octopus with chorizo, spaghetti vongole with clams, pumpkin and manchego arancini, truffled field-mushroom burgers, and warm chocolate fondant with hazelnut gelato. As for drinks, Goldfinch’s wine selection favours rosé, while the cocktail list features some tantalising twists on the calssic – the jaffa martini, blood-orange mojito and chocolate negroni sound particularly choice. Goldfinch is now open. Booking details and opening hours can be found in the Stumble Guide.